I think the standards for behavior have been lowered. Jessica and Namine met some friends for lunch at Culver’s. They had arrived a little early, so they sat and waited. 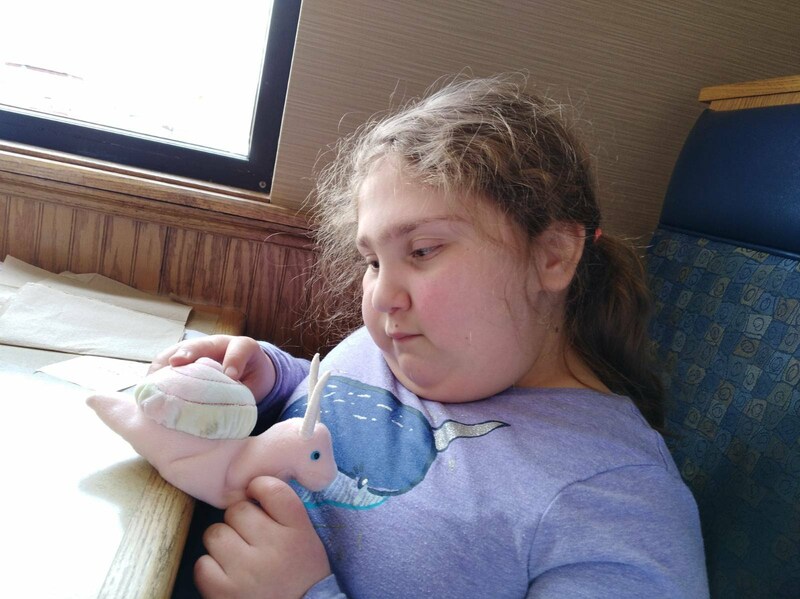 While they were still waiting, a Culver’s employee approached them and asked Jessica if she could give Namine a plush snail for being so well behaved. Jessica said yes. I think she's looking at its shell, not its mouth. Namine said thank you for the toy. She loves it, and it has become the latest sleeping buddy at bedtime. Now, don’t get me wrong: I think it was very nice of the employee to give Namine a toy. But while their heart was in the right place, I think it sends the wrong message. Good behavior should be expected, not surprising. I think it’s a sad state when someone is not only surprised by, but also feels the need to reward, a child’s good behavior. Namine was doing nothing other than waiting. Sitting there, literally just sitting and talking. Shouldn’t that be expected? Why is that surprising? After Jessica and Namine had had lunch with their friends and were leaving Culver’s, Jessica noticed another child. This one was not sitting still. This one was running through the store, dodging tables, and yelling. I often wonder if Namine’s time in surgeries and hospitals have matured her faster than she would be otherwise. It has certainly taught her patience, self-sufficiency and self-reliance; we know that much. Whatever the case, if a child’s good behavior is surprising, then Namine is more than welcome to keep surprising people. Personal note: this snail is weird. It has eyes in its head, not in its eye stalks. And those aren’t eye stalks, I think they’re either antennae or horns.